The last step you take when retouching a photo is to apply the Unsharp Mask filter, which adjusts the contrast of the edge detail and creates the illusion of a more focused image. 1 Choose Filter > Sharpen > Unsharp Mask. 2 In the Unsharp Mask dialog box, make sure that the Preview option is selected so that you can see the results in the image window. You can drag inside the preview window in the dialog box to see different parts of the image or use the plus (+) and minus (-) buttons below the thumbnail to zoom in and out. 3 Drag the Amount slider until the image is as sharp as you want (we used 75%). As you try different settings, toggle the Preview check box off and on to see how your changes affect the image in the image window. Or, you can just click the image in the dialog box to toggle the filter off and on. If your image is large, using the display in the dialog box can be more efficient because only a small area is redrawn. 5 (Optional) You can adjust the Threshold slider. 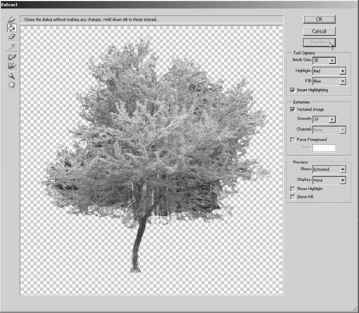 This determines how different the sharpened pixels must be from the surrounding area before they are considered edge pixels and subsequently sharpened by the Unsharp Mask filter. The default Threshold value of 0 sharpens all pixels in the image. Unsharp masking, or USM, is a traditional film compositing technique used to sharpen edges in an image. The Unsharp Mask filter corrects blurring introduced during photographing, scanning, resampling, or printing. It is useful for images intended for both print and online viewing. The Unsharp Mask locates pixels that differ from surrounding pixels by the threshold you specify and increases the pixels' contrast by the amount you specify. In addition, you specify the radius of the region to which each pixel is compared. The effects of the Unsharp Mask filter are far more pronounced on-screen than in high-resolution output. If your final destination is print, experiment to determine what dialog box settings work best for your image.